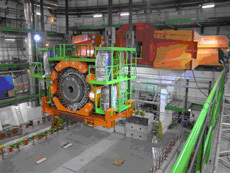 The HF subsystem of the CMS detector (seen here being lowered underground in November 2006) is now producing data. The CMS forward calorimeter, known as HF and lowered underground on November 11, 2006, is alive and well. As of March 28, the first slice of HF is recording "noise," including pulses created by cosmic ray showers penetrating the CMS detector hall 300 feet underground. Since lowering the HF underground three months ago, CMS scientists and technicians have connected cables, installed electronics and hooked up services. All that preparation came together on March 28 when the first HF data was taken in a "slice test." Click here to view a plot of the first data set. The data was recorded using the final hardware, front end electronics, cables, and DAQ electronics along with the CMS run control. This makes the HF the first CMS subsystem to take data in the collision hall. Coming in tomorrow's issue of Fermilab Today : Update on LHC inner triplet magnets. 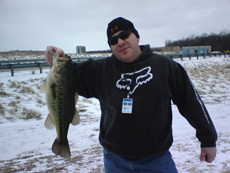 Derek Plant took this photo of Bill Dymond catching a bass in the Main Injector pond on March 3. Fermilab Today recently ran a picture of an employee with a large fish that piqued a reader's curiosity. It got him thinking about the low levels of tritium that were discovered in Fermilab ponds in 2005. The concentration of tritium in the surface water at Fermilab is well below the US Environmental Protection Agency standard for drinking water, but the reader wanted to know more about the fish: If the fish spent its whole life in the water, was it possible it might have built a higher concentration of tritium over time? The answer is no, because tritium does not become incorporated into any part of the body. Bioaccumulation occurs when a certain compound is retained by an animal's tissue, usually the fat tissue. For example, mercury builds up inside salmon fat, and over time, the salmon has a much higher concentration of mercury than does the surrounding water. Another example is Strontium-90, a long-lived radionuclide that is not produced at Fermilab but is found in the environment as fallout from atmospheric nuclear weapons tests. Strontium-90 is chemically similar to calcium, and animals incorporate it into bones. Tritium is different from both mercury and Strontium-90. An isotope of hydrogen, tritium binds to oxygen to make tritiated water. Tritiated water moves through organisms in the same way that normal water does. "So the concentration of tritium in fish is no different than the concentration in the surrounding water," said ES&H Section physicist Don Cossairt. "You can't concentrate water and you can't significantly concentrate tritium. Cooking the fish would drive the tritiated water out of the fish, so a person would consume an even lower concentration of tritium from eating the fish than from drinking the water that the fish swam in." You can find a fact sheet about the low levels of tritium at Fermilab here. 1. The Main Injector and Main Ring ponds are restricted to employees. They are not open to the public. The public is allowed to fish in the ponds in the public areas of the site. 2. You must have a valid Illinois fishing license. Illinois Conservation Officers occasionally make trips through the lab to check people's licenses. 3. The ponds are treated with an algaecide called Cutrine plus to control algal blooms. The agent is used in small amounts, and is deemed safe by the EPA. But you can avoid the chemicals by sticking to Swan Lake and the site's eastern lakes, such as the AE Sea. "The eastern lakes never get treated," said lab ecologist Rod Walton. "Just the edge of Swan Lake is treated occasionally, but that is usually done later in summer." 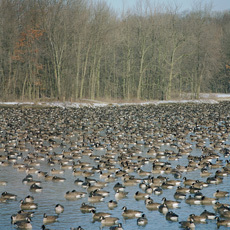 You don't need to spend much time at Fermilab to realize the site is a haven for Canada geese. Avoid nesting areas and goslings. Show them who's boss: When challenged by a goose, workers in Fermilab's Roads & Grounds Department yell and flap their arms. Maybe it doesn't look especially cool, but this technique has been 100% effective in getting geese to back down. Get help: Roads & Grounds (x3303) has a limited capability for dealing with problems in critical areas. 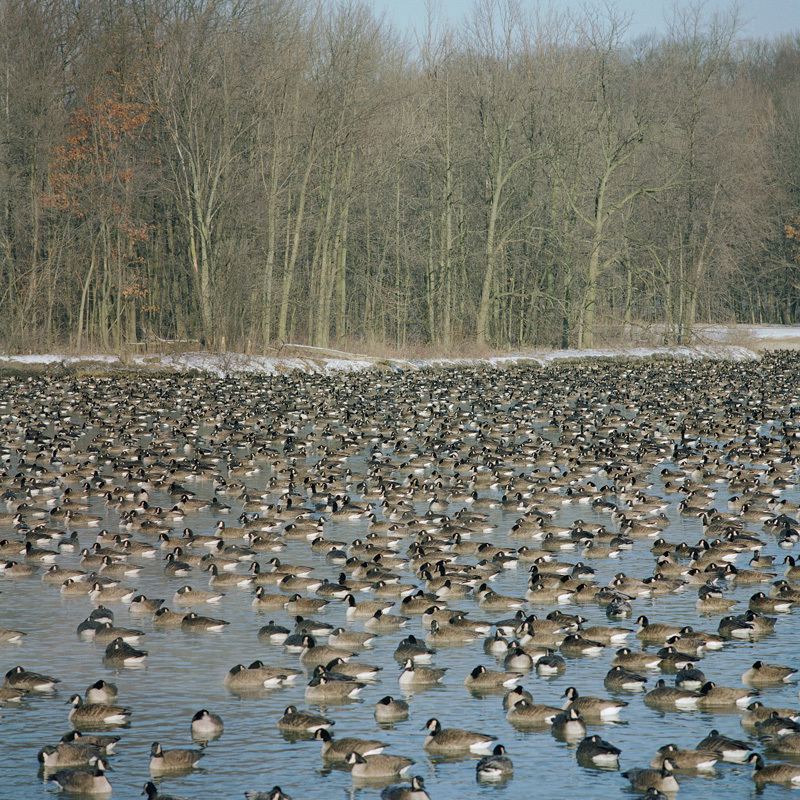 They can place temporary fences between nests and walkways or apply deterrent chemicals to grassy areas where geese forage. In some highly sensitive areas, with a permit from the Department of Natural Resources, nests can be removed. House and Senate appropriators reacted very positively to Energy Under Secretary for Science Ray Orbach and the FY 2008 request for the Office of Science at key hearings this month. While six months remain before the start of the new fiscal year, all signs are upbeat on the budget request. The new issue of symmetry is now available online. Print copies will be distributed in about 10 days. The Pierre Auger observatory has launched a new web site. View the site here. New classes are always being added to the professional development schedule. For the most up-to-date course offerings, visit the professional development web page. Fermilab employees, family and friends have the opportunity to purchase tickets at a discount on these special nights. Tickets regularly priced at $46.00 are available for only $36.00. Games are Bulls vs. New Jersey Nets, Fri.,April 6th at 7:30 p.m., and Bulls vs. Charlotte Bobcats, Fri., April 13 at 7:30 p.m.. More information and registration forms can be found in the Recreation Office or at this web site. Deadline to order tickets is two weeks prior to the first game ordered. The United Center presents Champions on Ice on May 6 at 1:00 p.m. Fermilab employees save up to $10.00. Information, ticket prices and order forms can be found in the Recreation Office or at this web site.